Costumes worn by men and women and boys and girls participating in the Indian Republic Day are a multi-varied sea of bright colors, subtle hues, and intricate designs. Although India gained independence from British rule on the 15th of August, 1947 the King of England remained the head of state of the Dominion until a constitution was drafted and implemented on October the 2nd, 1950 and India became a republic with its own President as head of state. 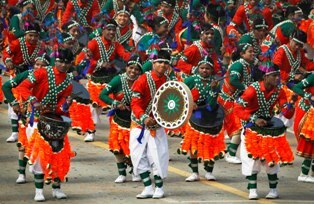 The Indian Republic Day parade is held every year to commemorate this occasion and children and dancers from all states participate in the parade in their most vibrant and colorful Republic Day costumes. The parade starts in the government capital of New Delhi near the Presidential Palace (the Rashtrapati Bhavan) at Raisina Hill (India’s administrative center) and ends at the historic Red Fort. The parade traverses the Rajpath or King’s Way, passing through Vijay Chowk (Victory Square) and the India Gate styled after Paris’s Arc de Triomphe. The President who is also the Commander-in-Chief of the Armed Forces takes the salute from military formations. There are also Air Force jet fly pasts and the floats celebrating the multi-hued cultural diversity of this large nation. Celebrations are also held in state capitals where they are presided over by the state Governors. One of the most popular, colorful and visually striking floats is that from the desert-and-mountain state of Rajasthan. The Rajasthan dancers come out with their beautifully bedecked camels that are covered in richly embroidered saddles and throw rugs festooned with fresh garlands and large necklaces. The men themselves are very distinctive in their technicolor loose turbans or “pagaris” expertly wrapped around their heads, flowing robes, and loose trousers. The women wear very colorful block-printed or tie-and-dye fabrics. Richly adorned long flowing skirts called ghagaras or lehangas are common with the women and worn with matching blouses. A ten foot length of colorful tie-and-dye material called an odhni is tucked into the skirt and covers the head and shoulders. Cottons, silks, brocades, and rich embroideries along with large pearl necklaces and gold jewelry distinguish the actors portraying young princes and princesses. Another great attraction is the Kerala dancers from the south of the country in their best Republic Day finery. They are also known as Kaliyattam or Thiriyattam is a Kerala folk art practiced by males where the actors wear flamboyant makeup and costumes in the vein of Japanese Kabuki performers but even more similar to Indonesian traditional folk dancers. The performances portray Hindu mythological divine and heroic characters and the actors costumes are extreme examples of colorful gaudiness, in fact there is no costume more extreme in the whole world. The performers design elaborate costumes for themselves that are wider then knightly armor and festooned with breast plates, leaf dresses, bangles and amulets covering the arms from shoulder to wrist, painted faces with huge ornate head dresses and painted feet with large anklets.